From our warning section in the forum: The Pogg has given us a heads-up regarding seriously dodgy goings-on at Tobwin.com and related site affiliates.tobwin.com. Turns out these guys were displaying a Curaçao licence badge on their site (see below) which linked to a fake certification page (now offline). Research indicates the casino is apparently licensed in Costa Rica though that is unconfirmed. In addition they’ve been playing the “Terms swapping” game with players in order to deny winnings. The Pogg fully documents such a case on his site. To Betsoft’s credit they supposedly shut Tobwin down when the site’s funny business was reported to them, but the site is still online and showing Betsoft games. Unfortunately this caution also applies to 77jackpot.com and its related affiliate program 77affiliates. 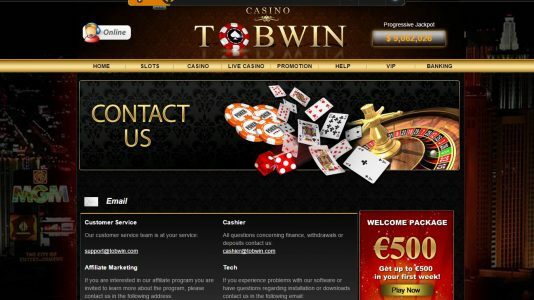 Going to affiliates.tobwin.com brings up a 77Affiliates page where the connection with 77Jackpot.com is explicit. The 77 sites are obviously closely connected to Tobwin, hence the additional warnings. Avoid these casinos at all costs!